The Oak Park Performing Arts Alliance presents three drama productions every school year. The audience fills the Pavilion with laughter and cheer, especially at the end of the night when the whole cast comes out on stage for applause. But who is behind all of these productions? Throughout the years, Oak Park High School’s drama department has put on many productions. These plays and musicals require rehearsal time expended by OPHS actors and actresses and the work of the director in preparation for opening night. However, the hard work does not stop there. How these productions get off the ground so quickly? Who decides the costumes, or who sets up the stage sets and backgrounds? The only people that are seen on stage are the actors. The audience may not be aware of what goes on behind the scenes. Crew and costume crew make up a large part of drama productions — behind the scenes, rather than up on stage with the cast. Behind the scenes, crew and costume crew work hard to set up the stage, lighting, sound, props and, of course, costumes. The crew will build a set background, paint it, make sure everything fits nicely on the stage, and move around props and stage furnishings during a show. “My job is to essentially man the soundboard, make sure the actors sound good. I make sure that when they walk on stage, their mics are on. Just general sound stuff,” Karoly said. Crew rehearses, too, in order to prepare for the show. “Sound prep includes getting a mic list to see who gets a mic, testing the sound, etc,” Karoly said. Teacher, producer and crew manager, Russell Peters, acts as an intermediary between crew and cast. The crew will go to the woodshop, measure and cut out stage walls and paint them in order to dress the stage. This creates a possibility of a woodshop accident, such as accidently cutting yourself, or worse, cutting off a thumb (ask Mr. Prescott, this really happened to a student in the past). The drama department has a costumes crew to take care costumes and makeup as well. 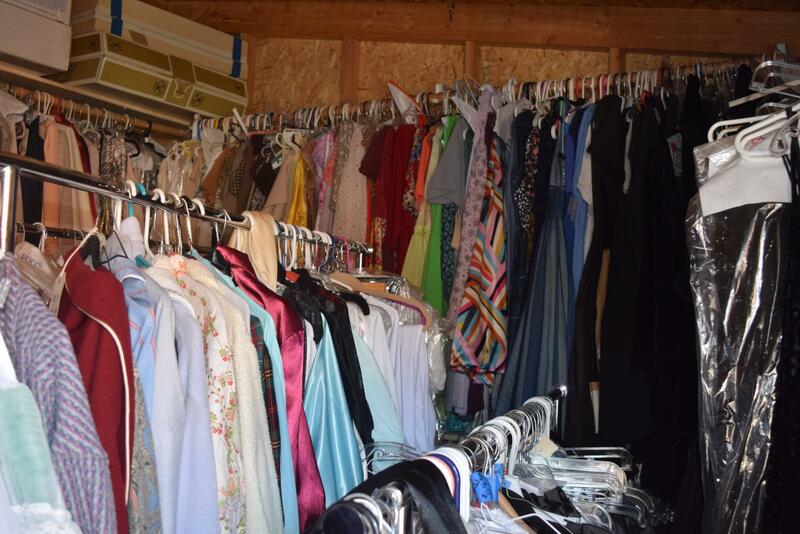 As the costume coordinator for productions under the Oak Park Performing Arts Alliance, Carla Schnurr coordinates and teaches the basics of wardrobe creation to the students on costume crew, which includes the departments of costumes, hair and makeup. Crew and costume crew put in many of hours and work towards a production and play an integral role in helping productions run smoothly. “Hell week” is the notorious week before and leading up to the opening night of a show. During this week, the cast, crew, and costume crew all have rehearsal every day for several hours after school, staying there until late into the night. “We all dread this week, because it is so time consuming and we work super hard,” Schraeder said. Crew and costumes ultimately ensure that everything goes smoothly for the actors and actresses on stage. Director Allan Hunt discussed the relationships between cast and crew members. Karoly said that there wasn’t always a mutual friendship between cast and crew. Senior and cast member Alex Labrecque said he believes that because crew is not seen on stage directly, they don’t receive enough credit for their work. “Because crew is in the background and not on stage, so they don’t get seen until the last show of the production. Then, the only recognition they get is at the end of the show, which is really not enough praise for all that they do for us,” Labrecque said. The crew in the professional world, as Hunt said, is very different. For example, on a Broadway production, the house crew is hired by the theatre owner to work on shows. According to Playbill.com, Broadway theatres will have to hire many different employees to design and build a set, including a permanent house carpenter, house electrician, house propman and a flyman. Furthermore, these house heads will typically hire crew members to work under them, making the construction of a set more efficient. They not only build the sets, they also have to prepare them to be moved on and off stage via a machine on stage as well as other set work. However, one must apply for membership of the stagehands union before being put on a Broadway show crew. In order to join, one must pass a written test during the apprentice program, and work for a certain number of years in local shows before making it to Broadway. Hunt said that crew receives more credit now than they did in past productions. For instance, crew used to consist of outside professionals that would work on the show. Now, crew consists students, so they are recognized for their contributions as young individuals doing a “professional” job. All of the collaborative efforts put forth by each branch of the theatre department are what makes these shows possible. When it’s all said and done, on opening night or at the last show of the production, it’s vital to know that there is more to “Beauty and the Beast” than just the Beauty and the Beast. This story was originally published on The Oak Park Talon on October 1, 2018.